I say a couple of months ago, because we all love it so much it's been renewed twice! 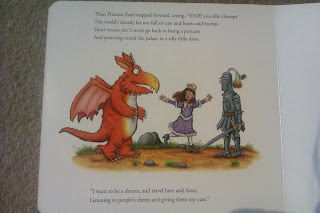 It's a lovely story of a young dragon trying so hard to be the best in his class at dragon school that he keeps getting into scrapes, only to be helped by a little girl who turns out to be a princess. As usual with Scheffler's work, the illustrations are really fun and lively, with lots to look at and notice anew at each reading. And, as I'm not all that keen on the whole princess thing, I loved the plot twist at the end where Princess Pearl decides not to go back to her castle, but to become a doctor! We'll have to take this book back to the library on Christmas Eve, and it will be with a very heavy heart that we do so. But I've dropped some very heavy hints to my mum so hopefully it may appear under the Christmas tree the next day! Every Sunday in Advent, I will be posting up a Christmas-themed post. Here's number 3, about how Christmas can bring communities together. Number 2 was about the gifts we buy our children, and number 1 was about why we aren't telling our daughter Santa is real. Do have a read of them too! After reading this one, of course. Looking back at the Christmasses of my childhood, I'm hard-pushed to remember the gifts I got. What I do remember, with nostalgic sweetness, was the times when Christmas showed me I was part of something bigger. I'm talking about the nativity services when I sang and acted with my school friends while our parents watched on. 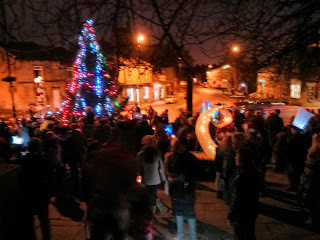 I'm talking about venturing out in the dark to stand around the village Christmas tree singing carols. I'm talking about carrying a Christingle in church surrounded by the rest of the congregation. These moments warm my heart. Because Christmas isn't just about gifts and food. It isn't even just about family (although of course family is and important part of it). Christmas is an opportunity to see ourselves as part of a wider community - whether that community is based around a school, a church, or a locality. 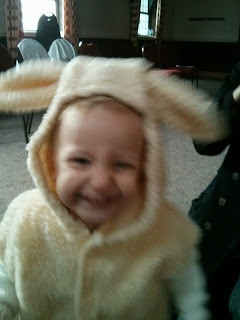 Yeah, OK. She was a bit of a giddy sheep. And she was a bit bewildered by what was happening (especially as the part of Jesus was played by her doll wrapped in a tea towel) but it was so exciting to see her take her place alongside the other children and actively participate in the service. Even if she did keep shouting, "Mary have a bayy-by!" and, "My dolly! My dolly!" 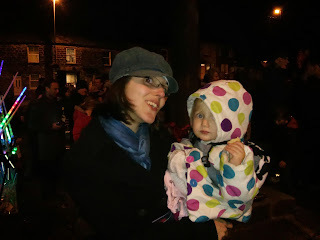 Toddler was perhaps a bit young to fully appreciate the event, but she enjoyed the drums which led the parade, she happily sang 'Away In a Manger' (regardless of whether that was what everyone else was singing) and she had a little dance to 'Jingle Bells'. She didn't seem to notice the crowd at the time but on the way home she chatted away as usual and started to talk about the, "people walking," so maybe she did start to feel the community spirit. Christmas can make connections in a way that rarely happens any other time of year. There is a sense of togetherness in the air, and this is what lingers in the memory long after those 'must-have' presents have been forgotten! 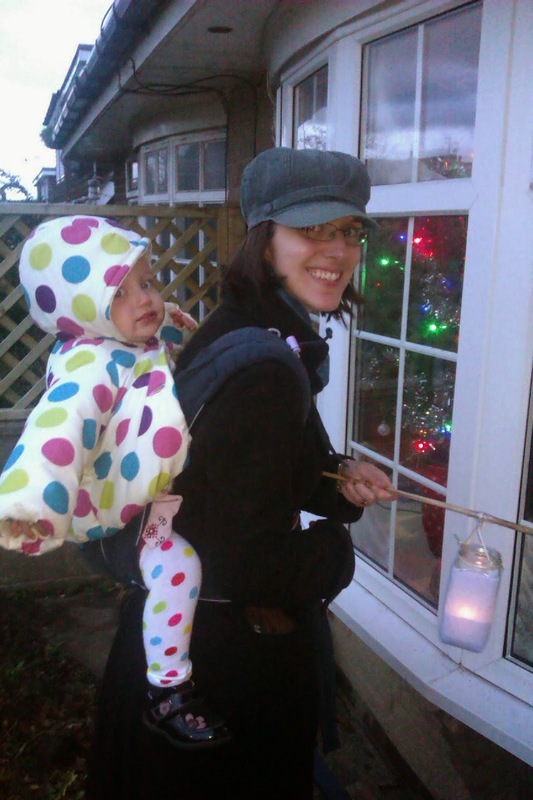 What community events do you take your children to at Christmas? Leave a comment and spread the joy! 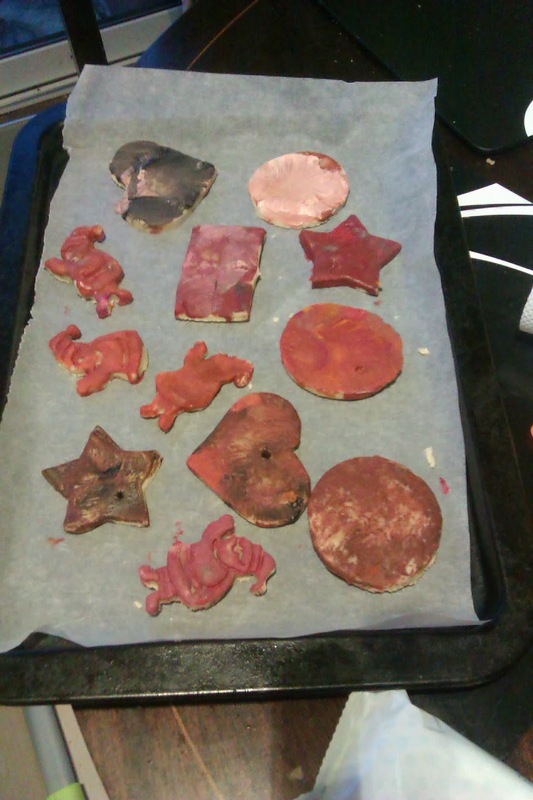 Ugly/Beautiful Salt Dough Christmas Decorations! Rolling out the salt dough. Er, that's not how you use a rolling pin! ... but sometimes Mummy's help is required! Then it started to go a bit wrong! The decorations pre-baking - please ignore the legless Santa! The finished articles. Umm. Lovely?? ... as did an effort to paint the entire tray. 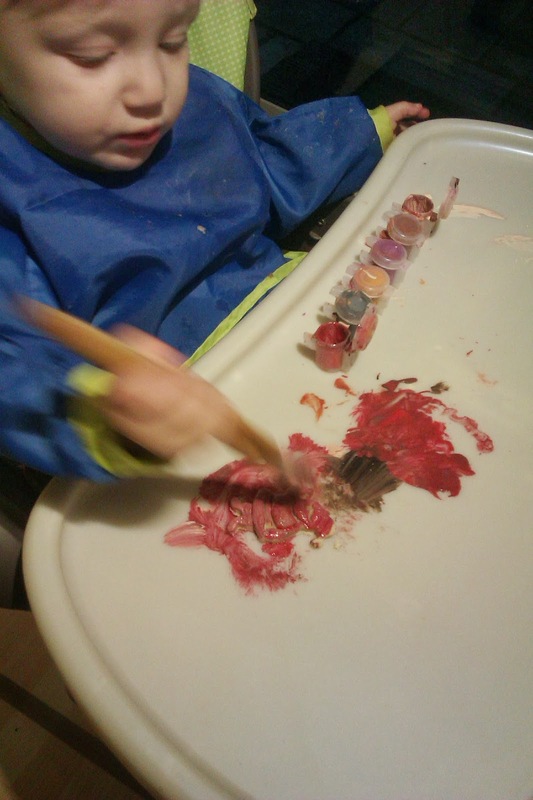 I'd been telling her to paint the decorations 'right up to the edge' - a phrase she repeated as she daubed her food tray in gore-like mess! There's no two ways about it - the finished decorations are pretty ugly. I mean, c'mon people, a black heart on your Christmas tree?! But to me, and probably to Toddler, they're beautiful. Because we made them - or rather, she made them, I just helped, far less than I expected to as well. She had fun, I felt proud, everyone's happy. And despite their ugliness I can't wait to hang them up. It's enough to warm your black heart, ain't it?! Too many toys? What's the alternative? Every Sunday in Advent, I will be posting up a Christmas-themed post. Here's number 2, about the gifts we buy our children. To read the first post, click here. As I mentioned in a recent post, we recently moved house. And this, dear reader, is what it taught me. We have a lot of stuff. Note, those are just her cuddly toys (and actually, we missed out the giant white bear that is technically mine but which she has commandeered). She probably has as many, if not more, non-cuddly toys, ranging from a simple hammer-and-peg game to a toddlerised tablet. But the question is, does she play with them? And I mean really play, not just pick up and drop 10 seconds later? BBC News recently featured an article saying that today's children have too many toys, and I'm inclined to agree. I've watched Toddler over the past week, and while she will play with a lot of her cuddly toys, when it comes to the other stuff, she might play with three or four in a day, sometimes not even that. 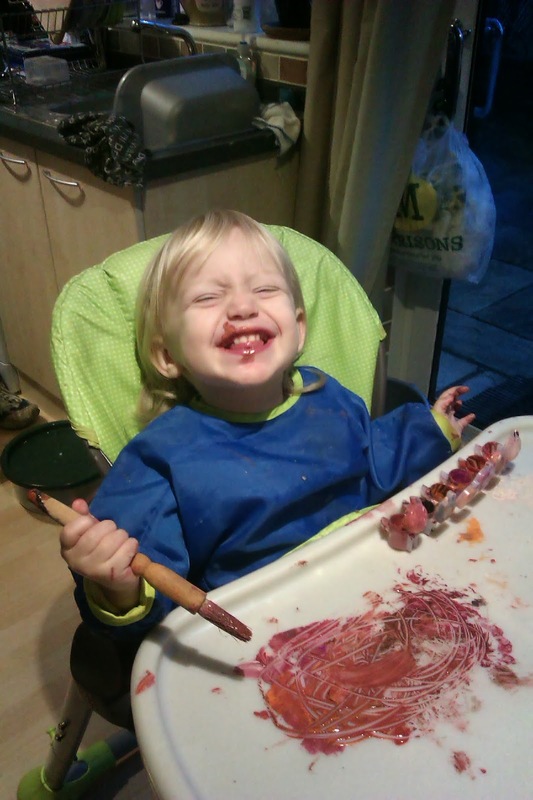 She will, however, play with kitchen utensils, paper, a tube from a roll of clingfilm which she uses as a didgeridoo, and lots of other non-toys. So do we really need this many toys? Probably not. In fact I do wonder if the sheer number of toys she has is actually impeding her ability to properly play - why get deeply involved in one toy for ten minutes when there are nine other toys nearby that she could spend one minute with each? As Christmas looms, we are planning to put away a good number of her toys in the loft. We are bracing ourselves for the deluge of new toys, not least because her birthday comes hot on the heels of Boxing Day. But we have asked relatives to avoid buying toys for her, so hopefully that will stop her being overwhelmed with choice again. 1. Clothes - this is particularly appropriate for Toddler because, with her birthday being just after Christmas, she will be going up an age bracket. But clothes are always a useful gift for kids; after all, you're not going to worry as much about your kid getting covered in mud or paint if there are plenty of clean clothes in the cupboard, are you?! 2. Books - Toddler LOVES books. In fact they are the main reason many of her toys are neglected; she'd much rather be read to. 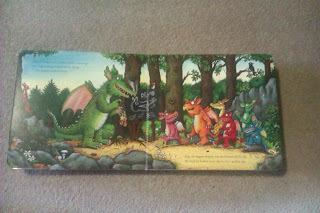 Give a child a book and you're giving them another world to explore - which they might then recreate with their toys! 3. Edibles - Chocolate is a staple gift for children (oh, the memories of all those selection boxes I got!) but if you'd rather not go for that there are other options. 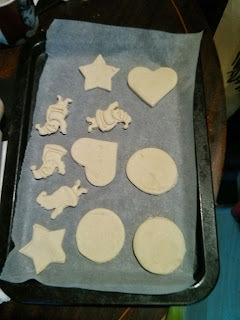 Maybe gingerbread or fruity cookies to give a sweet treat that will fill them up enough to stop them gorging? Anyone else got suggestions for this option? 4. Experiences - This doesn't need to be a huge thing like a trip to Disneyland or anything. It could be a term of classes in something your child would enjoy, or a promise of a day trip somewhere you've never been before. This is probably an idea for older children who are more likely to be able to deal with the delayed gratification that this entails - or the very young who don't really understand all this gift-giving malarkey anyway! 5. A Christmas tradition - this could be a really small and simple gift; a tree decoration, a snow globe, a candle holder. Something that the child can contribute to the decoration year on year and that serves a reminder of the person who gave it, and of their involvement in the creation of the Christmas magic. Toddler already has two tree decorations from last year and I'm looking forward to when she's old enough to hang them up herself with pride. There are probably tonnes of other suggestions I've missed here, so if you can think of any, please comment below, I'd love to hear your ideas! I take Toddler to our local library every week to get a new pile of books, and the selection is incredible. This week, I spotted A Letter For Bear by David Lucas nestled among the board books. I flicked through and thought the illustrations were gorgeous so I thought we'd give it a whirl. Toddler absolutely loves it. In one day, I estimate that she made me read it around 20 times. No, I'm not kidding. 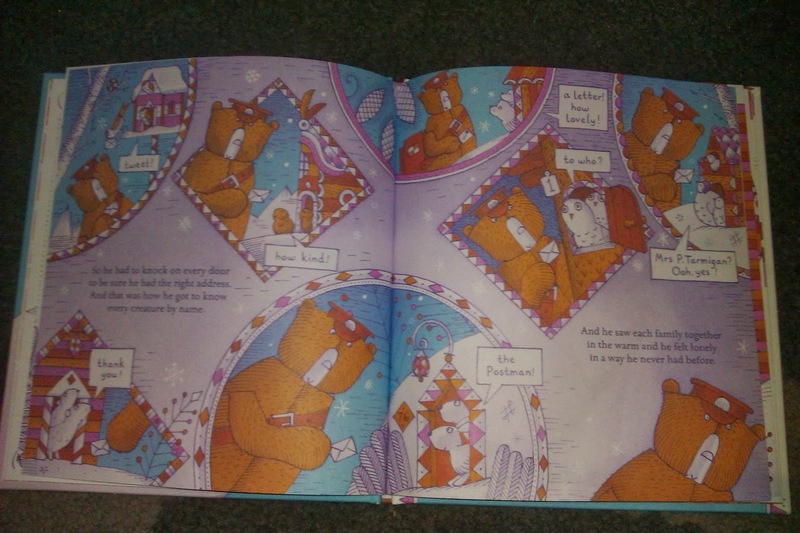 And I don't blame her; it's a really simple but lovely tale of a postman bear who dreams of getting a letter one day, until he meets his neighbours and invites them to a Christmas party. After an anxious wait, they all arrive and the next day Bear is flooded with thank you cards. Such a simple yet effective story, I still get a lump in my throat reading the last page! The illustrations are just beautiful too; a mixture of rich jewel colours and icy whites and blues, the pictures just scream 'Christmas' at you, and the detail means there is always something new to see. What I love most about this book is the fact that it is a Christmas story with exactly the right values for the season - community, generosity, friendship and thankfulness for even the smallest of gifts. All this with absolutely no mention of Santa, which those of you who have read this post from last week will understand is quite important to me! This book was only published last month so I'm impressed my library has already got a copy, but I think we'll definitely buy our own for next year. 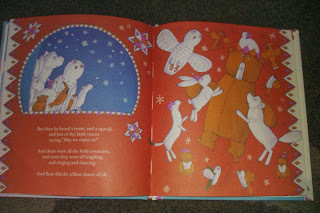 It's such a lovely book that I hope it becomes a festive tradition for our family. Last week something remarkable happened. Toddler drank from an open cup. OK, maybe it's not that remarkable to you. But it was for us. Until last week, she still mostly drank from a lidded sippy cup, and it was causing me a bit of anxiety. She's nearly two, shouldn't she be able to drink from an open cup by now? Am I not doing enough to encourage this? How can I teach her? Then on Sunday we went to a party for Toddler and the children of the other mums from my antenatal class, a kind of preemptive birthday party for them all. There was some food, and the drinks were served in open cups, this time without handles. Unable to help her because of the lack of space, I braced myself. But she wasn't fazed at all; she just picked up the cup and drank happily, then held it up saying, "more duice!" We were flabbergasted. What's my point here? Well, I suppose it's that I need to trust toddler to learn things in her own time. There I was fretting that she'd never learn to drink from an open cup without my intervention, but she just decided the time was right, and told me! It's the same with lots of things. When she was a baby we engaged in the futile task of showing her how to crawl - but she figured it out weeks later, when she was ready. 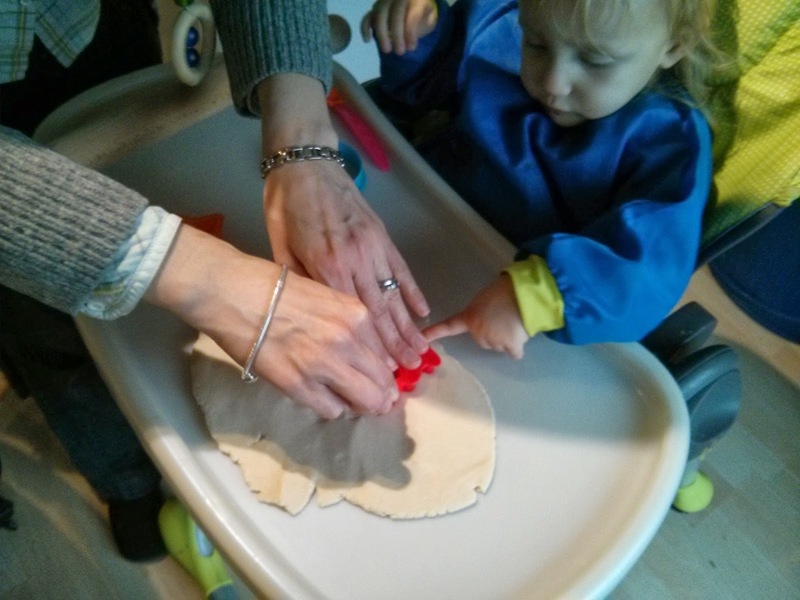 We resisted the urge to hold her hands and encourage her to walk, and guess what? She did it all by herself, when she was ready. We just had to trust her to know when the time was right - she did all the learning herself. Similarly with acquiring knowledge. I used to get into a flap thinking, "oh my word, she doesn't know any colours, surely she's the only toddler IN THE WORLD who doesn't know any colours!" - or any other subject I inexplicably felt was important that day. So I'd go to the library, get a bunch of books about colours expecting her to take weeks to learn them - within a couple of days she'd cracked it. Would it have hurt to wait until she picked up a colour book herself? Probably not. I learnt to trust that she'd learn things in her own time, as long as I was around to furnish the necessary information in a non-pushy way. This thinking can also be applied to behaviour. Hard as it is to deal with tantrums in a gentle way, or to feel like yours is the only toddler who doesn't sit nicely at story time or 'share' with other children, learning about appropriate behaviour is another thing that, I believe, doesn't need to be rushed. 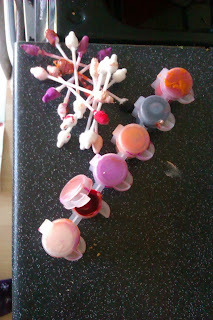 This is why I never make Toddler say please, thank you or sorry - if I make her, it's meaningless anyway. Far better for me to model that behaviour and when she's capable of understanding she will follow my lead. She's already picking up on please and thank you, although it's still a slow process. 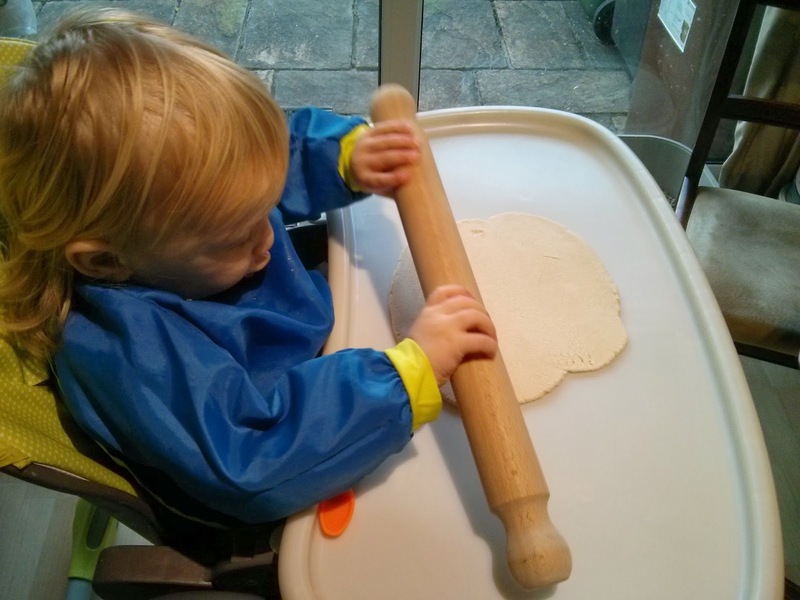 So much of parenting today seems to be about encouraging your child to do something they might not be ready to do. 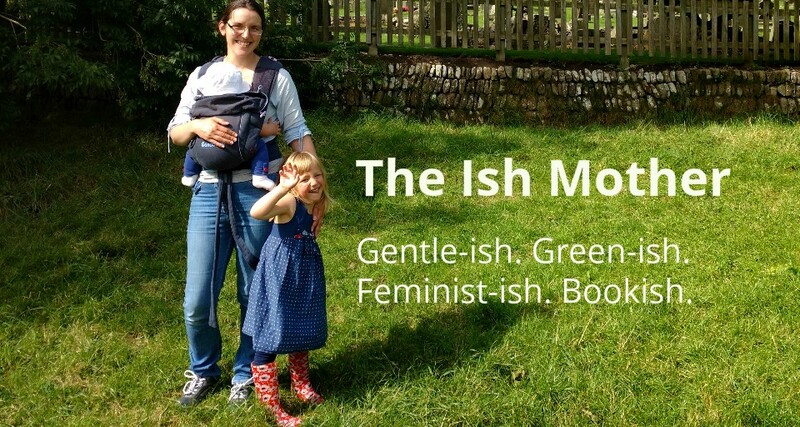 But isn't it more respectful, gentler and, let's face it, easier to trust your toddler to develop at their own pace? 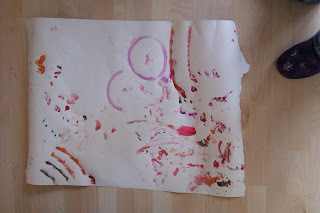 I'm starting to feel that my role in Toddler's life right now is not to teach her, but to be taught by her! She's teaching me how to raise her in a compassionate, undemanding way, and as long as I hold up my side of the bargain by being a good role model and being there to answer her questions when they arise, she'll develop all the skills she needs. When she is ready. Every Sunday in Advent, I will be posting up a Christmas-themed post. Here's number 1, let me know what you think! Brace yourself, blog reader, I'm about to tell you something you may find surprising. Perhaps even shocking. I may even be inviting the world to run after me with pitchforks. I'm Not Going To Tell My Daughter Santa Claus Is Real. "WHAAAAT?" I imagine you all crying. "Why not? Why would you deprive your daughter of the magic of believing in Santa Claus? Surely it's what Christmas is all about for children?" OK, maybe I'm being over-dramatic here. But still, I expect that my decision would be considered unusual, to say the least, by most people. Santa, or Father Christmas if you prefer, is so ingrained in our culture now, surely belief in him is just a given for small children. How would Christmas even work without this belief? Well, I'm not too sure about the answer to that question, as last year Toddler was far too young to understand (or care) about what was going on at Christmas time, other than the fact that there was a fascinating array of twinkling lights everywhere we went. But, while I can't tell you how Christmas works without believing in Santa, I can tell you some of the reasons why we've made this decision. To be honest, the idea of being truthful about Santa may never have crossed my mind had it not been for a school friend who had been brought up not believing in him, as had her younger siblings. I remember thinking that it was a bit odd, but then her family seemed to retain the magic of Christmas so much better than those who did go along with the Santa myth. I suppose that's fairly obvious – make the magic of Christmas all about a mythical figure, and that magic will fade as soon as the child discovers the truth. I know that I became less enthusiastic about Christmas once I'd made The Big Discovery, and although I still enjoyed getting presents, eating lots of food and seeing family, the season lost it's sparkle for some years. My decision may also be influenced by my experience of believing in Santa. As the youngest of three, I had two brothers who knew the truth and liked to wind me up. I remember one Christmas Eve we'd been out late and, coming home in the car, one of my brothers pointed at the sky and said something like, "Look, there's Father Christmas flying away, we weren't in bed so you won't get any presents now!" I was distraught. This probably wasn't the only time they pulled my leg about Santa, but it's the most memorable. I also remember The Big Discovery – unable to sleep with excitement, I heard my bedroom door open and laid perfectly still. And saw Mum come in and deposit my presents. She tried to cover it up, bless her, getting a work colleague to write a letter 'from Santa' explaining that he sometimes leaves the presents with parents to distribute, but I recognised the handwriting and I wasn't fooled. I remember feeling deeply disappointed and sad. Not angry, just sad. Obviously I can't shield Toddler from ever getting wound up, or from being disappointed or sad, but at least I can avoid creating situations which will probably end up with those feelings. Linked to this is my very strong belief that we are role models for our children – what they see us do, they will emulate. If I lie about something, and continue that lie year on year, how can I teach Toddler that lying is wrong? How can I tell her not to tell tall tales, if I myself pass something off as true when I know it's not? Some parents may feel this is an exception to the rule, that if you're truthful most of the time something like this can slide. Maybe they're right. But I personally don't feel comfortable with it. Then comes my overriding reason. I mentioned before that The Big Discovery meant that Christmas lost it's sparkle for some years. The 'some years' bit is important here. Because shortly before I turned 16 I became a Christian, and from then on, Christmas had a new magic. I won't go into a big preach here about my beliefs, but for me, celebrating the birth of Jesus is what is truly magical about the season. I remember going to Midnight Mass by candlelight not long after I became a Christian, and finding the whole experience so awe-inspiring, it blew the 'magic' I'd felt as a child right out of the water. I look around now and I feel that Santa has usurped Jesus as the main emblem of Christmas, and I want Toddler to know the real reason we celebrate. So that's why I'm not going to tell Toddler that Santa is real. I will tell her the legend and say that some families like to pretend that it's real, and we will still have stockings, but that tradition will be preserved in the spirit of playfulness – "hang up your stocking, and Mummy and Daddy will play Santa overnight and leave some treats in it for you!" I don't know how it will work out in reality, and I imagine it may be tricky, but I'm not one for going along with things for the sake of an easy life. If anyone reading this has also chosen to be honest about the Santa legend, please do leave a comment, I'd love to know how it works for your family! 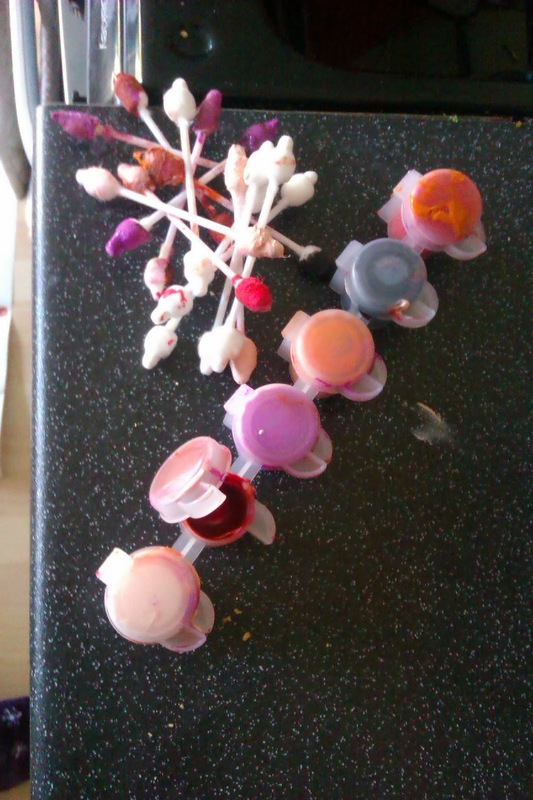 For the first 21 months of Toddler's life, we lived in a second floor flat. We had hoped to sell it and move before she arrived, but no such luck. It was a small block with a communal garden so we weren't totally deprived of outdoor space, but with a massive driveway that neighbours' cars could come up at any given moment, and no barrier between the driveway and the road, it wasn't ideal. We were desperate for a house. Actually, let's rephrase that: we were desperate for a garden. Somewhere Toddler could play without us worrying about her messing about with somebody else's plants or getting hit by an unexpected car. We finally sold our flat this summer, and moved in September. That was a heck of a long summer! Beautiful sunny days, perfect for a paddling pool, felt totally wasted on us. Toddler was getting to the age where she needed space to walk, run, climb and generally have fun, and we didn't have it. At last, we moved. 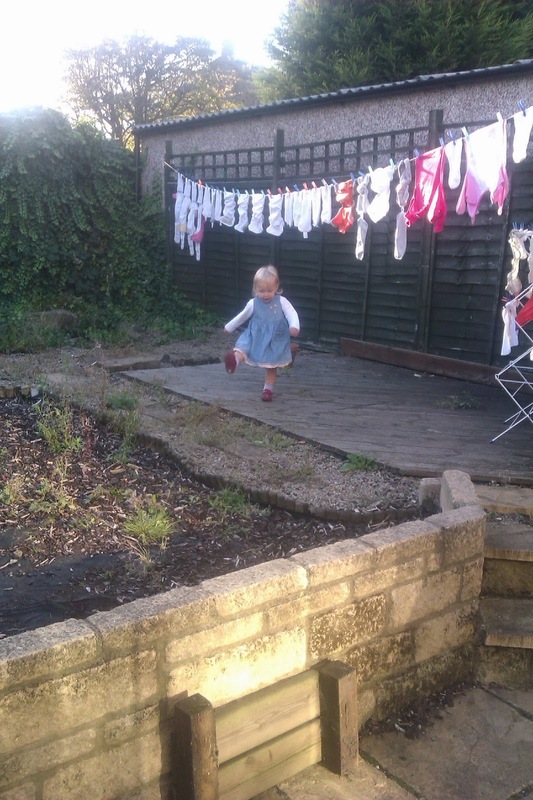 The garden in our new house is not at all child-friendly yet, but it's a garden! After one week in the new house, Toddler's legs were covered in grazes from climbing about (unsuccessfully) on rocks. Yes, she didn't much enjoy the grazes, but she learnt from them. She learnt to be more careful on rocks, but thankfully not that she shouldn't climb them – she's developed a great fondness for rocks since then! When we didn't have a garden of our own, we knew we needed one. But it wasn't until we got one that we realised just how much we'd been missing out. Even though the weather is turning cold now, we will still often spend half an hour or more outside, kicking a ball, drawing on the patio with chalk, hunting for widdy worms and spotting airy-panes. Aeroplanes, in case you didn't work that out. Of course, even if you don't have a garden, you can go to a park, a wood or some other big open space and have fun. But there's nothing like opening the back door and having your own little bit of the great outdoors to enjoy any time you like. It excites me to think about the possibilities we have with this garden. Snowmen in the winter, paddling pools in the summer, den building, teaching Toddler about growing food. We talk about making teepees, and I dream of finally using the hammock we were given as a wedding gift seven years ago! A child will thrive in any home as long as they are loved and given plenty of chances to explore the outdoors. But nothing quite beats having a garden of your own. There's been a lot of talk on Facebook and Twitter about Goldieblox, a brand selling engineering toys for girls. You can see the advert that has got everyone talking here. I watched the advert and this was my inner monologue; "Aww great, an advert telling people that girls don't have to like pink and princesses ... wow, look at those girls reinventing and subverting their traditionally girly toys ... this is awesome, I bet the product is going to be ... oh." Why the oh? Well, take a look at the products they offer: pinky-peachy-purply packaging covered with their signature character Goldieblox, with her preposterously voluminous golden tresses and massive eyes, looking like she's wandered out of a Disney movie. And the products themselves? A parade float and a spinning machine? Ooh look girls, you can make these typically girly items but it involves some special magic called engineering!! I should state, I'm not an engineer. In fact, I'm not sciencey or practical AT ALL - because I'm not of that bent, not because I'm female. I would love it if Toddler grew up to be more practical than me, but I wouldn't want to encourage this by giving her a product which says, "hey, you can do engineering, as long as it's ultimately related to something feminine!" I'd much prefer her to play with Lego or Meccano or something similarly gender neutral. Because those things should be gender neutral, no matter what people think. I really doubt that the way to get girls into science is to give it a pastel princess rebranding. The way to get girls into science is to give them the opportunity to play with toys encouraging these interests as early as possible, before the world of marketing has convinced that they need to be a pastel princess. And that's me off my soapbox. I need to tidy up Toddler's Duplo. She built a house this morning. Yeah. This Thursday, we woke up to glorious sunshine after a rainstorm overnight. The perfect conditions for a puddle hunt! I wrapped Toddler up in a fleece, puddle suit and wellies and myself in a big coat and wellies and we went for a little walk to a very country-like road not far from our house. "Pudda huntin!" Toddler repeated over and over. 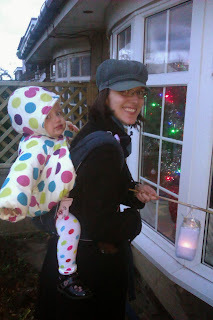 We haven't been for many walks without the pushchair recently, and it made me realise something. Or rather, I'm still too impatient. I knew I used to be – for all of those years I commuted to work, I would dodge around my fellow pedestrians who were just going too darn slow for me. I would get wound up at work about the time it took to get responses to e-mails, sitting on hold on the phone, waiting for other colleagues to do something so I could get on with what I needed to do. Because working life is so frantic, so busy, I felt like there was not a moment to lose. I rushed through my days, weeks, months and they disappeared without me even noticing. And then I became a mum. 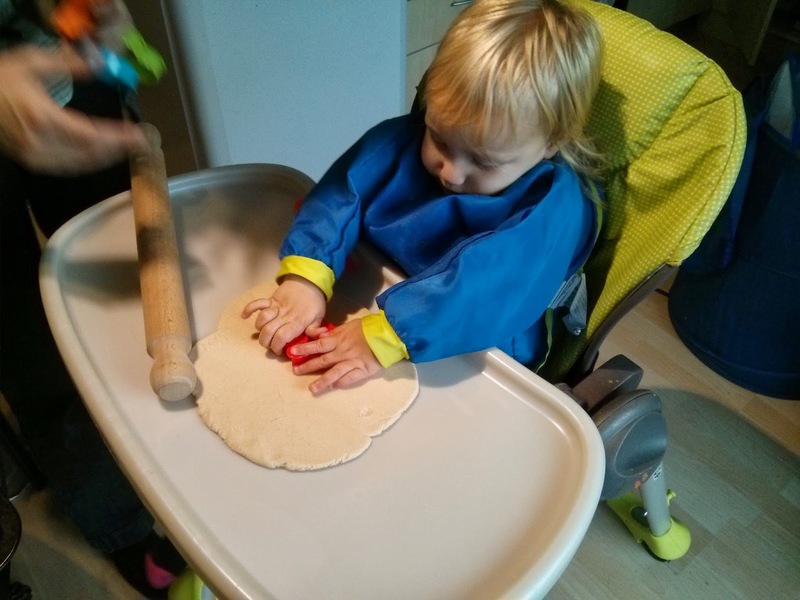 Five months into my maternity leave the opportunity to take voluntary redundancy came up, and I decided that a little bit more time off with my daughter would be nice so I took it. 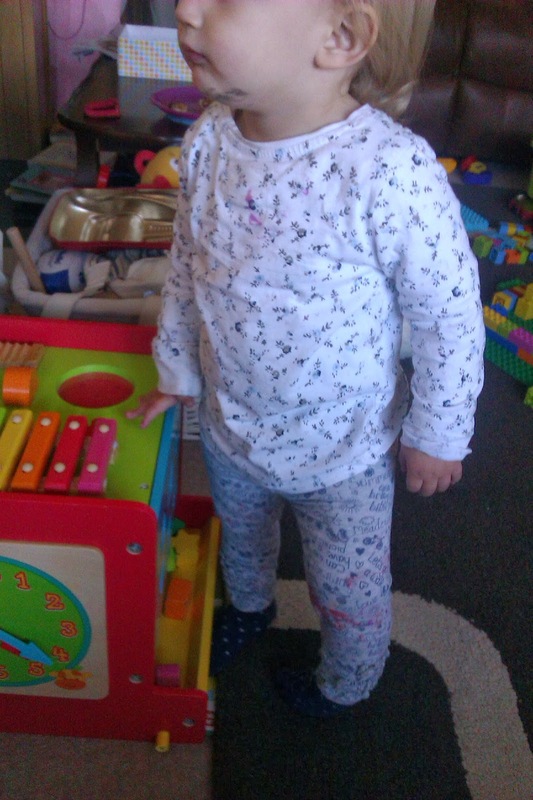 She's nearly two now and I'm still a stay at home mum, having decided that that is the best place for me right now. So I thought that I'd slowed down, wound down from the pace of working life. But as I walked along the street with my daughter, I realised I'm still like a coiled spring. I was impatient to get to the puddles, whereas Toddler just wanted to look at what else she could see on the way. As we walked I made myself calm down and notice things I'd normally rush past, because she was noticing them too. "Butterfly!" she cried, going past the spot where, six weeks ago, we saw a butterfly lying flat on the ground. She remembers it every time we go past. "Listen, what can you hear?" I said as I heard the clip-clop of horses' hooves coming up a path nearby. She froze and stared as the horses trotted past us. "Number 1!" she shouted, as she spotted a tile on somebody's wall. "Somebody else's number 1!" "Triangle," she said, pointing at a manhole cover. (Actually, she said, "tida," but I understood her!) "Rectangle," again pointing at another cover. Who knew a puddle hunt could turn into a Maths lesson? And, for a bit of balance, some literacy. "Sssss!" she hissed pointing at the letter S on a street sign. She tried some other letters, but struggled as they were capitals and she's used to lower case. Still, that street sign kept her entertained for about 3 minutes! It's a cliche, but sometimes children teach us as much as we teach them. In a busy, rushed, impatient world, I have been blessed with the opportunity to experience the world at a toddler's pace again. Now is the time to slow down. Note: I have used the word 'Reflections' instead of 'Review' here for two reasons. Firstly, 'review' implies a certain level of objectivity, even if the whole piece is not objective, whereas I read parenting books purely with my own situation in mind and so my write-up will be more heavily subjective than I would be in a review. Secondly, in a 'reflection' piece I can write not only about what I think of the book, but what the book made me think about me. I discovered Sarah Ockwell-Smith and ToddlerCalmTM through Twitter around the time that the BabyCalmTM book was released. "Great," I thought, "but my daughter's nearly one, babyhood is almost over, what the heck do I do with a toddler?" 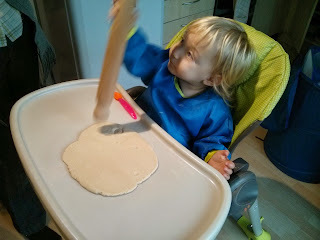 Then came the announcement that the ToddlerCalmTM book would be published (hurray!) the following October (boo, too long!). I waited rather impatiently for months and months, then when I finally received my pre-ordered copy I couldn't wait to get stuck in. The whole focus of this book is dealing with common toddler issues – tantrums, sleep problems, picky eating etc – in a way that is compassionate, gentle and in tune with the developmental needs of the child. Much of it runs counter to the prevailing attitude in our society that these issues need to be eliminated through punitive measures such as the naughty step, cry-it-out and the like, and as this is an attitude that I instinctively feel is wrong for my family, I knew that the book would be both affirming and helpful for me. I do have to qualify that, though, by saying I didn't like everything about it – more on that later. So what did I like about the book? First of all, I love the way it starts out by asking what personality traits you want your child to grow up with. This instantly gets you thinking about the bigger picture, and reminds you that your child won't be a toddler forever and the problems you're having now will one day be a memory. I'd already been thinking along these lines before I started reading; while waiting for the book's release, many problems arose which got me thinking, "I really need that book now!" only for those problems to pass. I love that Ockwell-Smith encourages us to take the long view, rather than focussing on 'fixing' our toddler problems as quickly as possible without regard for the effect these fixes will have on the child's development. The first part of the book is quite heavy-going in parts, with a lot about psychology and brain development. But, as much as this was a bit of a slog to get through, it is so important and eye-opening. Understanding just how differently Toddler's brain works to mine has helped me to see things from her point of view, and so focus on helping her instead of punishing her. It's as if I now realise that I need to 'fill in' for the bits of her brain that aren't developed yet – I need to help her regulate her emotions, I need to smooth things over when toddler clashes happen rather than expecting her to say sorry (because she won't be sorry really, and I don't want her to think sorry is a magic word to get her out of trouble). The science of toddlers is the basis for Ockwell-Smith's CRUCIALTM framework, which is a method for dealing with any toddler problem going. I won't go into an explanation of what it is here (for a start, that'd be bordering on plagiarism) but it's a really good framework for thinking about the issue and tailoring a solution to your own circumstances, without being too prescriptive. I have to say here, though, that Chapter 14, where CRUCIALTM is applied to a number of problems, gets a bit repetitive – but then I suppose few people will read the whole thing, choosing instead to focus on the problem that is presenting itself at the time. What didn't I like then? Well, this probably says more about me than the book, but I was kind of hoping for a magic cure to Toddler's sleep problems, and this was sadly lacking. 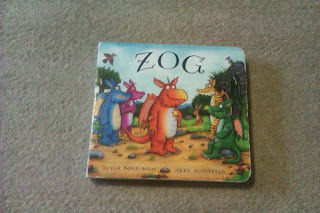 While it does deal with toddler sleep, if that's your main concern, this isn't the book for you. The chapter on sleep begins with some stats, showing that around a third of toddlers wake in the night. This is meant to be comforting – look how many other toddlers don't sleep through! But all I took away was – hey, two thirds of toddlers sleep through, and of the remaining, many of them probably aren't waking up every night like mine. So I'm in a minority! Although there are some pointers for trying to improve the situation, the main message is that, if your toddler's having sleep issues now, you'll just have to wait until they're older and it will fix itself. Perhaps I'm being very reductive there, but that's the message I took away. There are suggestions for a bedtime routine, but we've had one of those in place for over a year and it hasn't stopped her fighting sleep, or waking up in the night. (Also, the suggested bedtime routine relies on a few gadgets which – conveniently – can be purchased through the ToddlerCalmTM website. There are very few alternatives suggested to these.) So no magic bullet for getting the decent sleep that we all need. Ho hum. One other area I struggled with a bit was the discussion of praise. Again, this probably says more about me than the book. Apparently, phrases like, "well done," and, "good girl," are bad, and praise can reduce intrinsic motivation to complete tasks. I get this about rewards, yes – give a kid a chocolate for doing something, and soon they'll only do it to get chocolate. But I struggle with the idea that saying, "well done," when Toddler has made a particularly impressive Duplo construction, or a quick, "good girl," when she has tidied her toys away will turn her into an approval junkie. Reading this part of the book has made me rather paranoid about what I say to my daughter – maybe that's a good thing, but for the most part I think it's all about balance. While I've started using Ockwell-Smith's 'say what you see' approach a bit more instead of explicitly praising, I think little snippets of praise will always slip out and I don't see that as problem. I'm certainly not going to beat myself up about it! 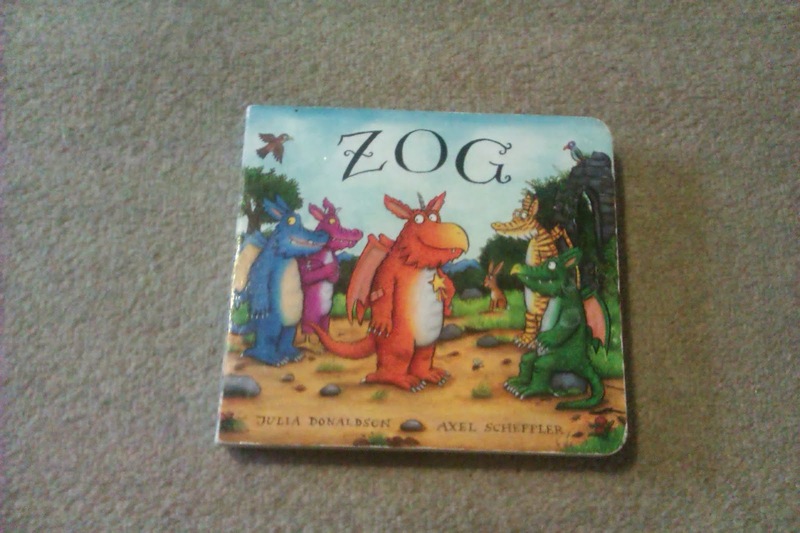 One other little niggle is that the hypothetical toddler in the book is always referred to as a boy. Only a minor thing, I know, but I prefer the modern convention of alternating between boys and girls. Feels more inclusive. Overall, I enjoyed this book and found it very helpful when it comes to the area of discipline and dealing with problematic behaviour. It confirmed to me that problems are not with the toddler, but with a society that expects toddlers to be little grown ups, and so hurries us through a period of their life which is in fact so rich with wonder, joy and humour. Hopefully, with this approach, I'll be able to replace 'terrible twos' with 'terrific twos' as I help Toddler to deal with the rough patches in her life, and enjoy watching a little person developing right before my eyes. 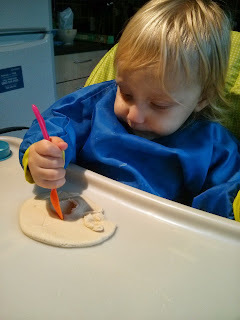 Thursday is a quiet day for us, so it's often the day I choose for messy play. This morning, after a run of bad nights, I was feeling pretty tired so decided to go for the 'easy' option of painting - 'easy' because all the prep required is getting out the paint and paper. Except it's not the easy option is it? That last photo doesn't really do justice to the sheer amount of paint coverage there was on her legs, and it was after washing her hands to avoid any further finger licking fun. 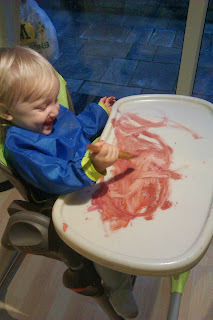 15 minutes of 'fun' and then a heck of a lot of cleaning up afterwards. 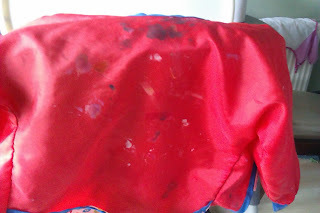 Ahh yes, that's why I hate painting. Raising a toddler often feels like a tug of war. On one hand, Toddler is striving for independence and control; on the other, she can get overwhelmed by too much choice or freedom. She wants to be an adult and a baby all at once. It's my job to respect both of these urges, no matter how stressful I find it. Now we all know how important clothes are in expressing who we are. 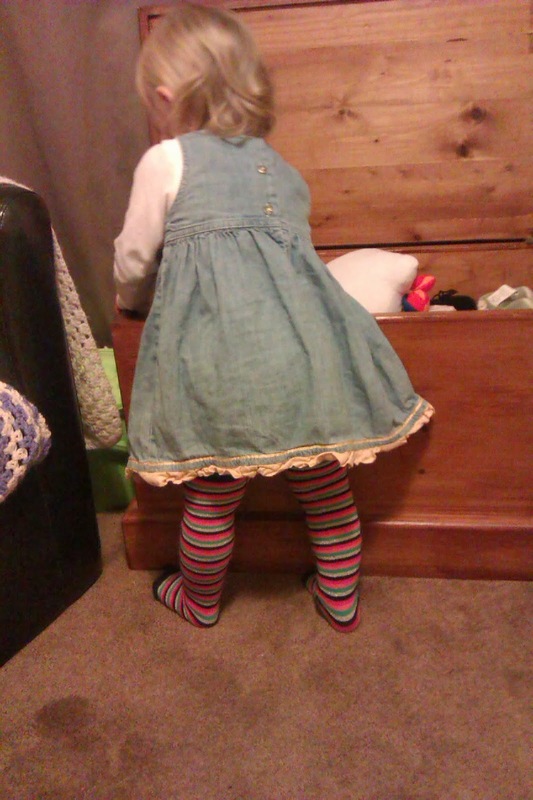 So one area where I'm trying to hand over control to Toddler is in her outfits. Over the past few months I've experimented with how much control she really wants at this stage. It started out fairly tentative – I'd maybe let her choose from two tops then pick the trousers myself, for instance. But that little scrap of power made her hungry for more, and so I had to give her more autonomy, in varying degrees. This requires a lot of patience – I'm not sure I'll ever forget the morning she took 20 minutes to choose a pair of tights. She'd pulled them all out of her drawer so I lined them all up on the side of her cot and encouraged her; "Go on, you choose a pair of tights and give them to Mummy." "Choose pair," she muttered to herself uncertainly, "choose pair." 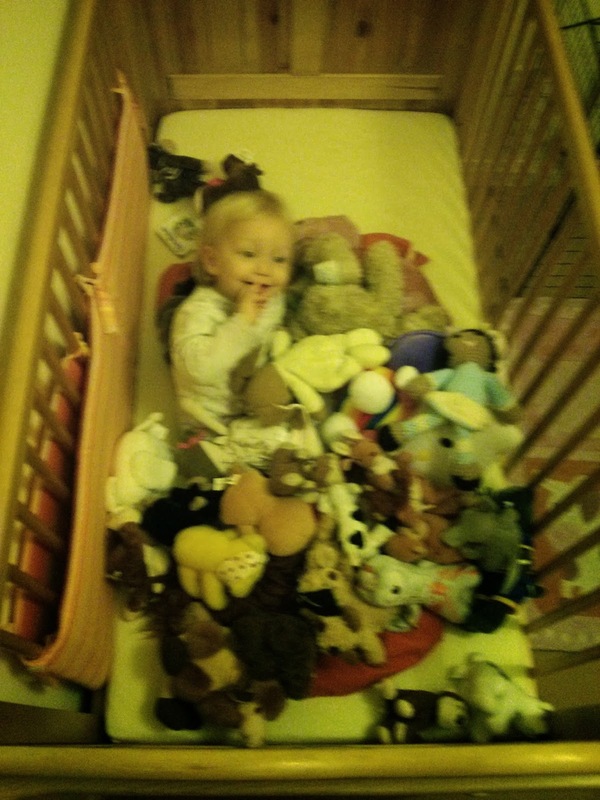 She pulled them all off the cot and started trying to put them back up again. "Choose pair." I took deep breaths while inwardly screaming, "YES, CHOOSE A PAIR, IT'S NOT LIFE OR DEATH!!" After that incident I decided maybe it'd be best to just give her a couple of options for each item of clothing. I started asking her if she wanted to wear a dress or top first of all, which she has got the hang of pretty well. I then give her a choice of two tops or dresses, then two of the appropriate accompaniments (trousers/leggings for the former, tights for the latter.) However, after the aforementioned 20-minutes-choosing-tights incident, Toddler is wise to the fact that she has far more than two pairs of tights, and will pull them out of the drawer and attempt to line them all up on the cot. So I quite like the days when she says, "top," straight away. ME: Which would you like to wear, dress or top? ME: OK. (picks out two tops, one of which is a bit long and has frills at the bottom) Which of these tops would you like? T: (grabs longer, frilly top) Dress! ME: Well, that's a top, but yes, you can wear that. OK, let me find some trousers. ME: No we wear trousers with tops, tights go with ... (notices T has already pulled out all of the tights) ... OK, would you rather wear a dress? (picks out two dresses) Which dress would you like? T: (picking up frilly top again) No! Dress! ME: OK, you can wear tights with the top, now choose a pair and give it to Mummy. I think you can see where this is heading. She did eventually pick some very bright, stripy tights to go with the delicate, pale pink, frilly top, and I insisted she wear some shorts too to preserve her dignity. She chose some tweedy grey ones. I thought she looked bizarre. Off we went to playgroup, me ready with the phrase, "She chose it herself," as a retort to any comments, but do you know what? Everyone said she looked really nice! I seem to remember the word 'stylish' came up at one point! As I related the battle I had getting her to choose her outfit, one mum said, "ahh you gave her choice, that was your first mistake!" She was only kidding of course, and I took it that way, but do you know what? It wasn't a mistake. 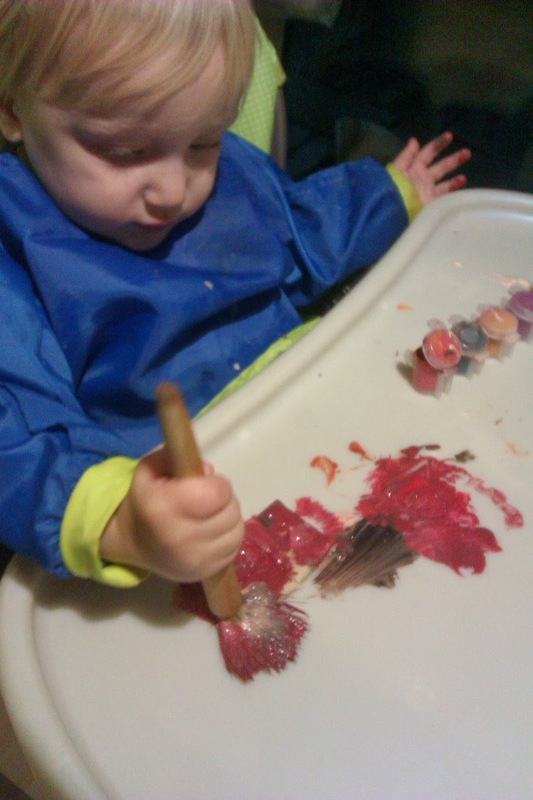 I was giving my little girl a chance to express herself, to control that part of her life, and she looked gorgeous. Because toddlers look gorgeous whatever they wear. It's the one time in your life where mismatching genuinely works. Yes, it takes much longer than just picking out an outfit I like, but I've found she's much more cooperative in getting dressed when she's had a say in the outfit so I'm happy to avoid the tantrums and play the waiting game. There are still times when too much choice overwhelms her, or she's just in an awkward mood. Sometimes she will say no to every top I pick out and eventually get bored and wander off to her toy box, at which point I generally ask her, "Shall Toddler choose or shall Mummy choose?" To which she invariably replies, "Mummy choose," having tired of the whole process, and I breathe a sigh of relief and pick out one that I like. But actually, I quite like being able to say, "She chose it herself." I like the mad combinations she goes for, and sometimes the words, "Mummy choose," are a bit disappointing because then I don't get to see what clothes she would put together. I'm sure that as she gets older, she will become even more assertive about what she wears, and the, "Mummy choose," moments will become few and far between. And I can't wait for that. Even if it means having the most uncoordinated toddler at playgroup. Husband: It's the Rugby League World Cup this year. There might be some matches nearby. Me: That would be cool, but would we take Toddler? H: I don't know, it's in November. Me: Oh, she'll be nearly two by then, she'll be much more grown up. H: Yeah, I reckon she'd be able to go. Me: Yeah, let's book some tickets. Fast forward to two days ago, as I looked at my nearly-two-year-old daughter, who wasn't that much more grown up. If anything, the passage of months had just made her more active and wriggly, and less able to focus on anything for more than a minute. (Unless that something is 'Raa Raa the Noisy Lion'. Which, unfortunately, is very different to a rugby match.) I had realised by this point that I had been a bit naive in thinking she could sit through an 80-minute match. But the tickets were booked for the following day's match between England and Ireland. No going back. It was very important to me that, at some point in her early life, Toddler should go to a Rugby League match. Having been mostly uninterested in sport for the first 27 years of my life, I suddenly got interested in Rugby League when pregnant with her. Up until then, whenever my husband watched it, I would shake my head, mutter something about it being a violent, horrible sport, and go into another room. But, being very pregnant, I didn't have the energy to go into another room, so I ended up watching it. And loving it. And realising that it wasn't actually violent as such – yes, it's very physical, rough, sometimes aggressive, but not actively violent. Thinking about it, it's a very good example of how to channel the need to 'play rough' in a non-violent way, which is an important message for young people. So Rugby League and Toddler seemed to be bound together by this revelation. 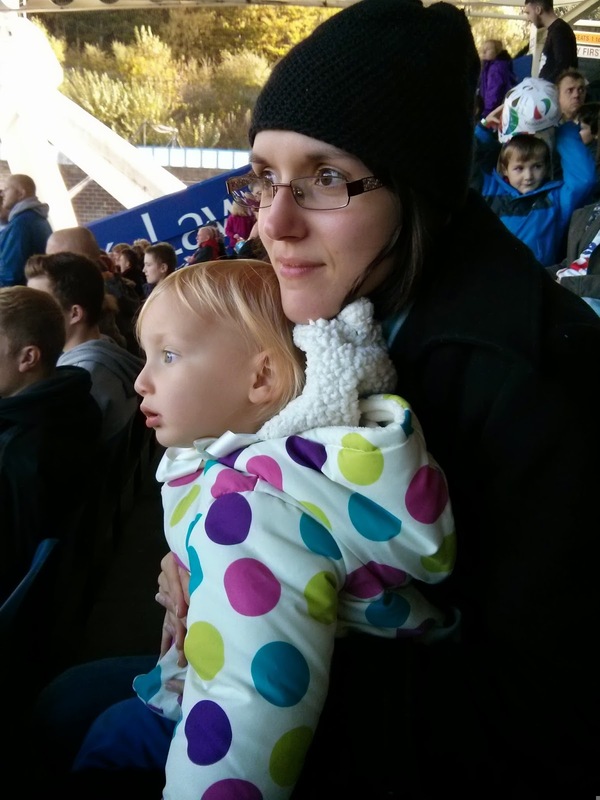 But of course, I couldn't go to a match when I was heavily pregnant, and going with a baby seemed too difficult, so I was yet to go to a live match myself, and I was excited to share a first experience with my little girl. I also wanted to take her to a match because I wanted her to know that she can be interested in whatever she wants. Sport is still often seen as a male interest, and RL is a pretty masculine sport, but the tide is changing and women are increasingly getting interested and involved in sport. I'd dabbled in sport as a girl, trying ineptly to play football at primary school, but it was mainly to prove a point, that girls could be sporty. Unfortunately, the fact that I can't run without gasping for air and am apparently unable to kick or dribble a ball with any level of control, I probably did more damage to the sisterhood than good. But anyone can watch sport, no matter how unfit and uncoordinated, no matter what gender. By taking Toddler to a Rugby League match, I would be broadening her horizons beyond typically 'girly' interests and showing her that she can like, do, be anything. All very lofty, of course. But we kind of overshot in our ambitions. Really, nearly two is a bit young to expect any child to sit through a match, let alone my very energetic daughter. We were also a bit silly to take her to see England v Ireland – it was a sell-out match, which meant a very crowded stadium (we booked three seats but somehow ended up with only two, it was that packed). We had to get there nearly two hours early to get parked, and even then the stadium car park was full. 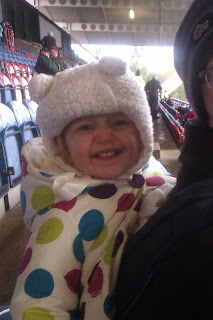 Also, going in November meant wind and rain, so we couldn't wander around in the time before kick off, we had to get Toddler under cover as soon as possible, so she was restless before the match even started. Half an hour in, she was asking to go home, but we did eventually manage to get her interested enough to get to the end of the match. Despite it not being the ideal first match, I think she enjoyed it. On the way from the car park to the stadium, she kept saying, "Rubby! 'Citing!" and pulling a very cheesy excited face. There were various things to engage her – she liked watching the mascot going round, and we joined in the chants to keep her amused. She even paid some attention to the action, shouting, "running," and, "passing," and, rather cutely, "oops," when someone got tackled. That evening she babbled happily about all the things she'd seen, and although when we asked her if it was exciting she said, "no," I think really she liked it. So I'm looking forward to taking her again. When she's a bit older. And the weather is a bit nicer. And it's a slightly quieter home fixture.